(Lancaster, Pa., Jan. 19, 2018) - All-Star catcher Anderson De La Rosa will return for a second season with the Lancaster Barnstormers, it was announced today by manager Ross Peeples. 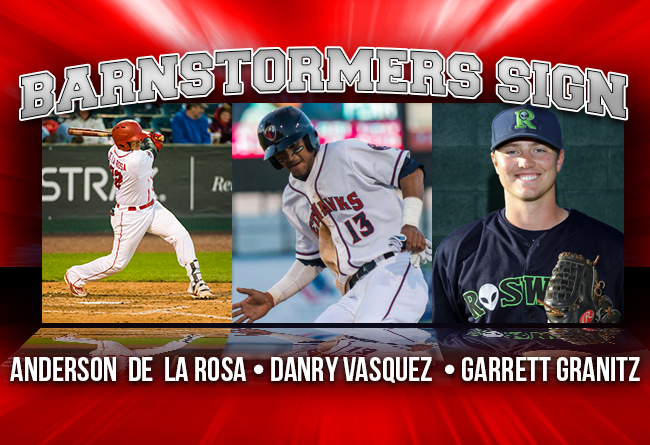 In addition, the Barnstormers have added left-handed hitting outfielder Danry Vasquez and right-handed pitcher Garrett Granitz. They are the first three players inked by Peeples, the reigning Atlantic League Manager of the Year, as he prepares for his second season at the helm. De La Rosa, 33, played in 91 games for the Barnstormers in 2017, batting .255 with three home runs and 38 RBI. He collected 24 doubles along the way. However, it was on the defensive side of the ledger where his talents really helped the ballclub, throwing out 34% (30-89) of potential base stealers and committing only four errors the entire year. The Venezuela native was one of Lancaster’s five representatives in the 2017 Atlantic League All-Star Game, played in Bridgewater (Somerset Co.), New Jersey. Prior to coming to Lancaster, De La Rosa spent ten seasons in the Milwaukee Brewers organization and one year apiece in the farm systems of the Kansas City Royals and Los Angeles Angels. Vasquez, 24, also hails from Venezuela. The lefty batting outfielder has previously played with the Detroit and Houston organizations, batting .278 over six pro seasons with highs of .311 in the NY-P League in 2012 and .315 in a 40-game stint with the Lancaster Jet Hawks of the California League in 2015. He has spent two partial seasons with Class AA Corpus Christi in the Houston system. He has batted .250 with one home run for La Guaira in the Venezuelan League this winter. Granitz, 31, has spent the previous two seasons pitching in the Pacific Association, the same league in which 2017 Barnstormers center fielder Darian Sandford had played, with the Pittsburg Diamonds and San Rafael Pacifics. In his six seasons in the unaffiliated leagues, Granitz, a sidearming right-hander, has amassed an 11-12 record and 3.22 ERA. He has 22 saves among his 171 professional appearances. The Wisconsin native pitched two seasons collegiately at Azusa Pacific, an NCAA Division II school, located East of Los Angeles. The Lancaster Barnstormers have completed their thirteenth season as a member of the Atlantic League of Professional Baseball. Home games are played at Clipper Magazine Stadium in downtown Lancaster, Pennsylvania. Please call 717.509.HITS (4487) or visit www.lancasterbarnstormers.com for more information.